While a great workout is awesome, the truth is that your recovery is just as important – and is actually how you get stronger. When you exercise, you’re causing small, microscopic tears in your muscles. In the 24-48 hours post-workout, your body works to repair and rebuild. Ensuring that you’re recovering properly can help reduce muscle soreness, prevent injury, and ensure you have the energy to hit it hard again tommorrow. Check out our ultimate plan for maximum recovery. Adding stretching to your cool-down is an ideal way to help reduce the dreaded DOMS. Stretching also helps to increase circulation and remove waste from your muscles, leading to an overall quicker recovery. Follow along with Kira Stoke’s 7-minute Stoked Stretch or Core Pilates NYC’s 15-minute Dynamic Stretching Routine. If you’re on-the-go, check out our 5 Favorite Post-Workout Stretches. During your workout, your body depletes its glycogen stores. Eating 30-45 minutes post-workout is important because your body is best able to absorb nutrients, helping to best repair and build your muscles. You’re best off with a combination of protein and carbs – if you’ve completed a cardio-heavy workout like running or kickboxing, try to eat something with a ratio or about 2:1 carbs to protein to best restore your energy stores. A sandwich, quinoa bowl, or energy bar is a great option. If your workout was more strength-based, up your protein to 2:2 to give you muscles what they need to repair. A smoothie, Greek yogurt bowl or an omelet works well. While we all know how important it is to hydrate before and during your workout, you also need to stay hydrated post-workout. If you’re not sure if you’re drinking enough, try weighing yourself before and after your workout. For every pound you lose, try to drink an additional 16 ounces. While water is often best, if you’re exercising intensely for an extended period of time, you may need to grab some coconut water or a post-workout drink to ensure you’re replenishing your electrolytes. Hydrating foods like watermelon, cucumber and strawberries are great too. Myofascial release is great for relieving tight muscles and boosting circulation, leading to greater recovery. If you’re feeling tight or sore the day after your workout, using a foam roller is a great option. 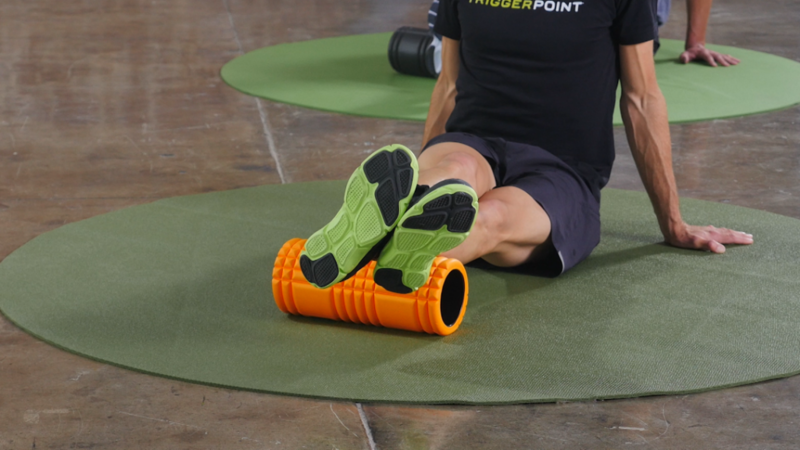 Check out Urban Kick’s Shane Bernard’s best foam roller moves or roll out with Trigger Point’s foam roller routines. If you don’t have a foam roller, you can also use a tennis ball for self myofascial release, such as in The Beyond Studios’ De-Quasimoto Routine. While you may not feel like it, it’s actually a good think to exercise even when you’re dealing with muscle soreness – as long as you’re not injured. You just want to avoid overtraining your muscles. So, if you worked out your upper body yesterday, try focusing on your lower body or cardio today. If its a rest day, it’s still a good thing to get some light movement in, whether it be taking a walk, doing some restorative yoga or swimming. Because the most growth hormone is released during sleep, ensuring that you’re getting enough sleep is really important for your recovery. Sleep deprivation also means increased levels of cortisol, the stress hormone, which can lead to cravings and overeating, and can even cause your body to store fat. If you’re having trouble sleeping, our best sleep tips post can help ensure you get your 7-8 hours. Like sleep, stress can play a big role in your body’s recovery. If you’re too stressed, your recovery will be slowed, meaning strength will be gained more slowly and you’ll be more prone to injury. Don’t let this info stress you out, though! Exercise itself is a great stress reliever, and making the time to relax can actually help your both your body and mind. This entry was posted in Fitness Tips and tagged myofascial release, post-workout, post-workout nutrtion, rest day, stretching, workout recovery on June 28, 2016 by Janelle Martel.